I am responding to your advertisement in the Renaissance webpage for new-stories. The Somers, Connecticut Shakespearean and Opera Society will be sponsoring a performing contest. A celebration in honor of William Shakespeare's birthday. To participate, each group or individual will be required to perform a selection from a play or sonnet, not to exceed twenty minutes in length. No fear versions accepted. Interactive allowed. Best overall performance by a group. Best performance by an individual. Best male lead, Best Female lead, Best original rewritten play ( Must be Shakespearean). Adjudicators from local television stations, and educators will comprise the judging staff. "Bardies" our Oscar, will be awarded at the closing ceremony of the Northern CT Renaissance festival. The winning group or individual will be invited to perform for an audience closing night of the two day event in May 31 & June 1, 2008. The SSOS will be accepting applications until March 1, 2008. Please contact us to receive a application package. Contest limited to ages 12 and up. SSOS sponsors an annual fundraiser The Northern Connecticut Festival during the month of May, as well as several unique performances in the park throughout the summer months. Future plans include a permanent performing space in the Town Of Somers, CT. Summer Theater teaching programs, Scholarships. Volunteers and donations welcome. This organization is in its second year, membership is free. A number of local Connecticut residents as well as National Shakespearean Fans have joined this exciting new society. All performers are welcome to audition for the Society. Wedding Photo Contest—HURRY! Deadline Is December 31! Were you recently married with a medieval/renaissance-style wedding? Enter our photo contest to possibly win some great prizes. Winners will have their photos published in the upcoming Special Wedding Issue #54 in March 2007. The Renaissance Festival Podcast in conjunction with the Brobdingnagian Bards have announced the commencement of the second annual Renaissance awards. 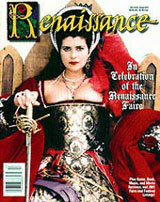 In 2005 they held the first ever such awards (that they know of) for best Renaissance Festival performers. Nominated and voted on by podcast listeners and Ren Faire Fans, these awards selected the cream of the crop. In 2005 the number one musical performers were The Lost Boys and the number one act in the non-musical category was the Tortuga Twins. The awards were so well received that it will become a permanent fixture on the Ren Awards Scene. To add someone to the voting pool or select your favorite among the existing nominees, participants can access the voting function and contest rules at http://www.renaissancefestivalmusic.com/awards/. Voters can cast their ballots from now until December 31st, 2006 with winners being announced in January of 2007. For those interested in nominating someone, the number one criteria is that they have performed at least one time during 2006 at a Renaissance Faire. This is a rare opportunity for Renaissance Faire enthusiasts to recognize the performers that they enjoy most at the Faires. Marc Gunn is an Irish and Scottish folk singer with a strange affinity for Celtic ballads, drinking songs and cats. He is the lead singer for the Brobdingnagian Bards, an internet music promoter, podcaster, poet, photographer and publisher of many, many things on and offline. Marc Gunn is the lead singer for the Brobdingnagian Bards. He is also Celtic music podcaster and promoters as well as publisher of Celtic MP3s Music Magazine. Wizards of the Coast, the Seattle-based company behind DUNGEONS & DRAGONS, has announced its first-ever D&D® FAN FILM CONTEST. Contestants in the D&D FAN FILM CONTEST are vying for more than just the thrill of letting their geek flag fly. One grand-prize winner will take home a new computer, video editing software, video camera, and a gift pack, which includes the limited-edition Colossal Red Dragon and D&D Chess Set. In addition, three finalists will receive round-trip flights to Los Angeles, along with hotel accommodations, to attend the final judging and awards ceremony. Deadline for submissions is September 1, 2006.
adherence to D&D genre (25 percent). The final three films will be screened in Los Angeles at the Worldwide Dungeons & Dragons Game Day, where the grand prizewinner will be announced.